1 The Environment and Child Labor Chris Neely The views expressed are my own and do not necessarily reflect official positions of the Federal Reserve Bank. 1 1 The Environment and Child Labor Chris Neely The views expressed are my own and do not necessarily reflect official positions of the Federal Reserve Bank of St. Louis, or the Federal Reserve System. 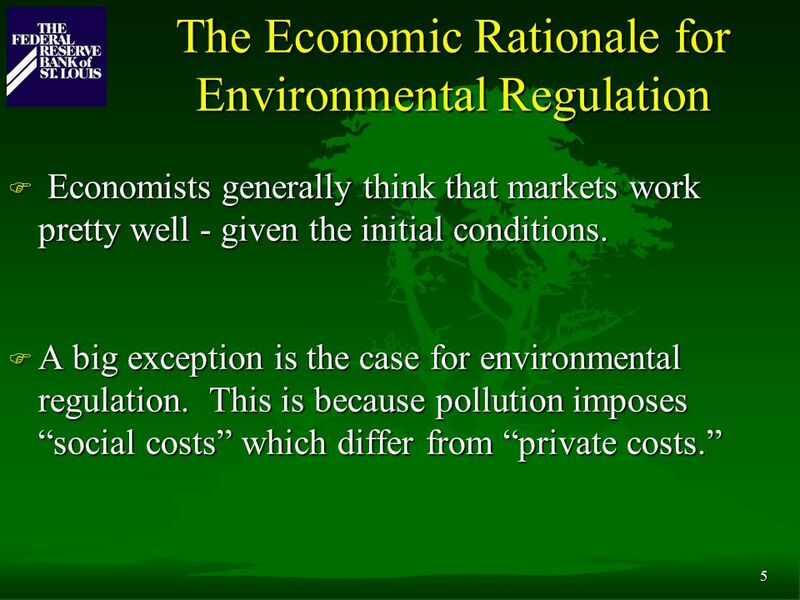 2 2 Topics F The Environment – The Concern About the Environment and Trade – An Economic Rationale For Regulation – How Economists Think About the Environment. 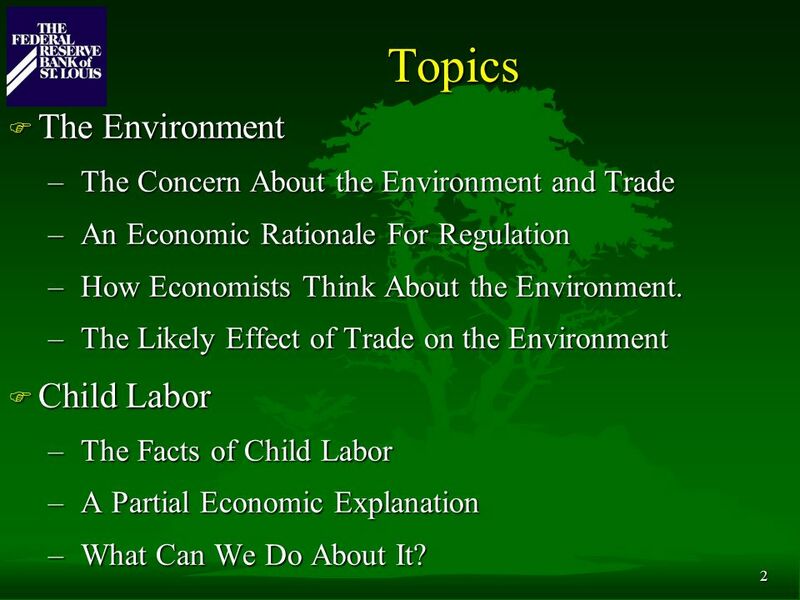 – The Likely Effect of Trade on the Environment F Child Labor – The Facts of Child Labor – A Partial Economic Explanation – What Can We Do About It? 3 3 WHAT I WILL NOT SAY TODAY. 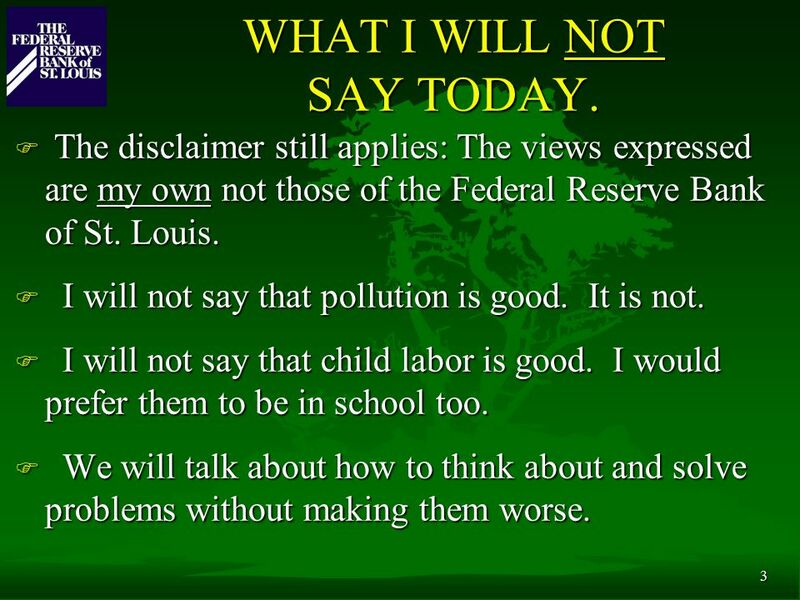 F The disclaimer still applies: The views expressed are my own not those of the Federal Reserve Bank of St. Louis. F I will not say that pollution is good. It is not. F I will not say that child labor is good. I would prefer them to be in school too. F We will talk about how to think about and solve problems without making them worse. 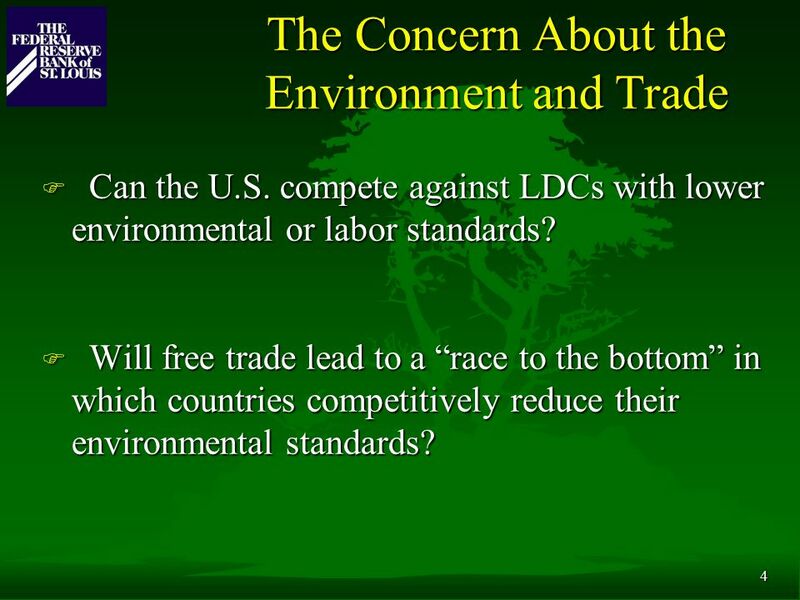 4 4 The Concern About the Environment and Trade F Can the U.S. compete against LDCs with lower environmental or labor standards? F Will free trade lead to a “race to the bottom” in which countries competitively reduce their environmental standards? 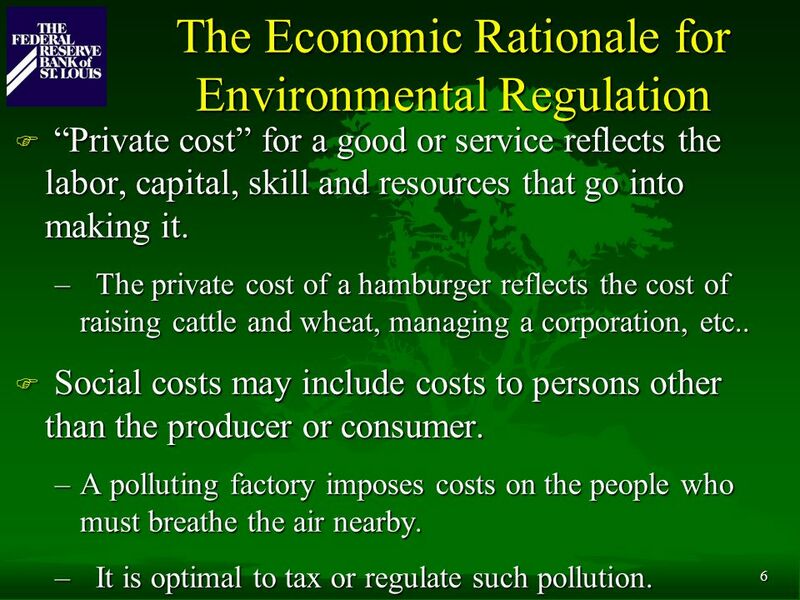 6 6 The Economic Rationale for Environmental Regulation F “Private cost” for a good or service reflects the labor, capital, skill and resources that go into making it. – The private cost of a hamburger reflects the cost of raising cattle and wheat, managing a corporation, etc.. F Social costs may include costs to persons other than the producer or consumer. –A polluting factory imposes costs on the people who must breathe the air nearby. – It is optimal to tax or regulate such pollution. 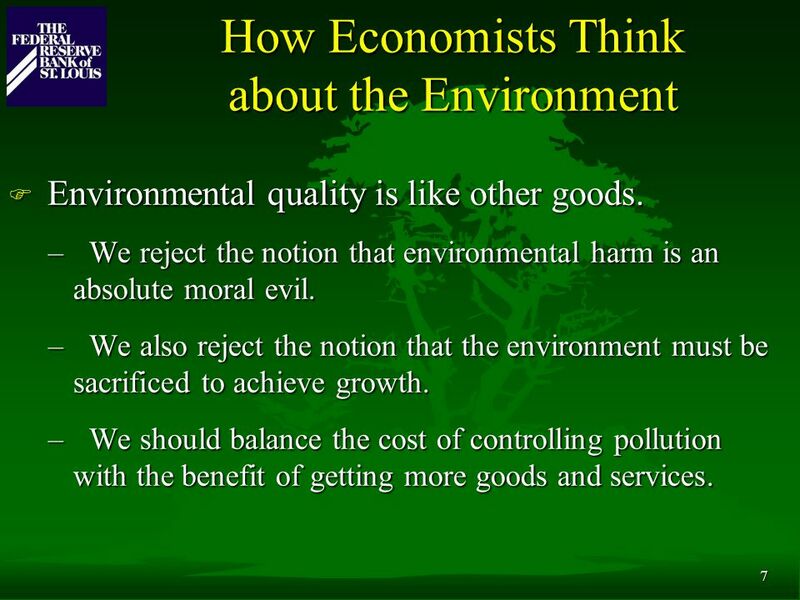 7 7 How Economists Think about the Environment F Environmental quality is like other goods. – We reject the notion that environmental harm is an absolute moral evil. – We also reject the notion that the environment must be sacrificed to achieve growth. – We should balance the cost of controlling pollution with the benefit of getting more goods and services. 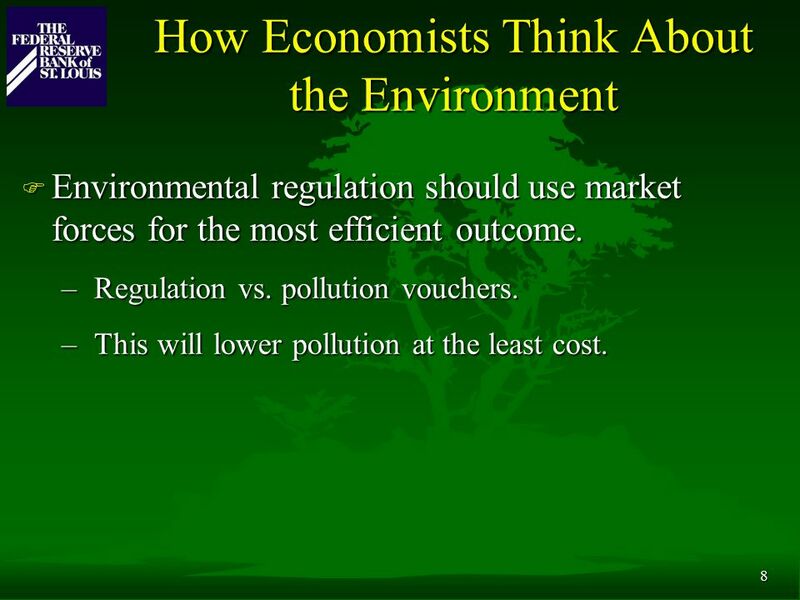 8 8 How Economists Think About the Environment F Environmental regulation should use market forces for the most efficient outcome. – Regulation vs. pollution vouchers. – This will lower pollution at the least cost. 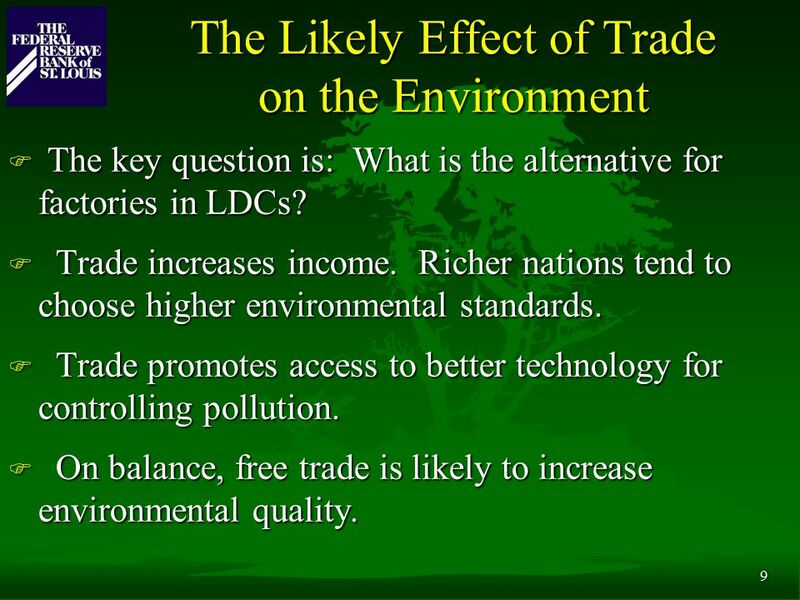 9 9 The Likely Effect of Trade on the Environment F The key question is: What is the alternative for factories in LDCs? F Trade increases income. Richer nations tend to choose higher environmental standards. F Trade promotes access to better technology for controlling pollution. F On balance, free trade is likely to increase environmental quality. 10 10 Child Labor F The facts: In much of the world, child labor is widespread. F Children work long hours, at low wages, under hard conditions. F It would be much better if they could go to school instead. 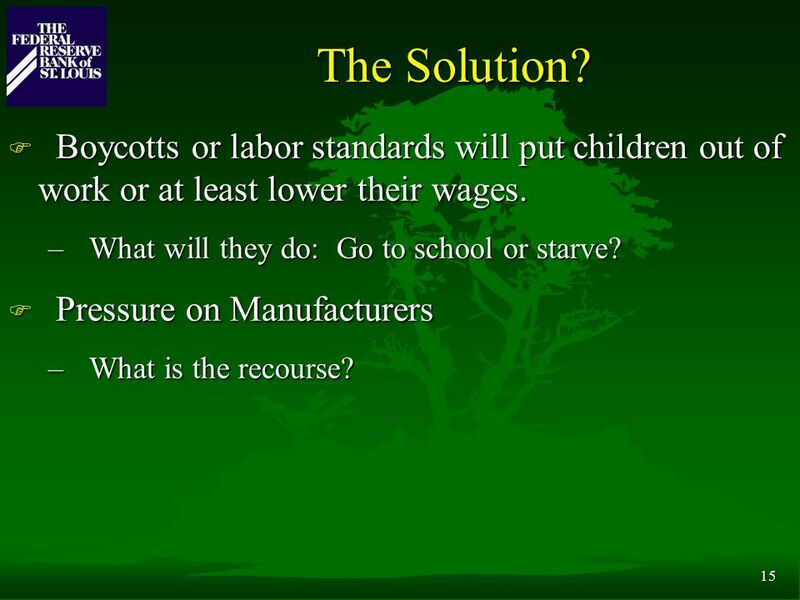 11 11 A Partial Economic Explanation F Child labor is widespread in very poor countries. F Child labor was widespread in the United States - and much of Europe - until about 1900. F Why does it exist at some times and places but not others? There are 2 explanations. – Laws prohibit it in the United States. – Economic growth made it unnecessary. 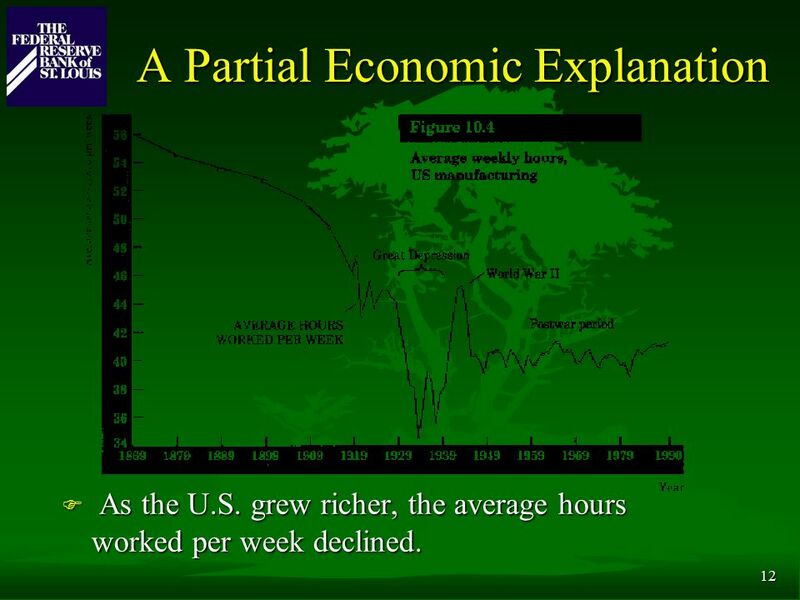 12 12 A Partial Economic Explanation F As the U.S. grew richer, the average hours worked per week declined. 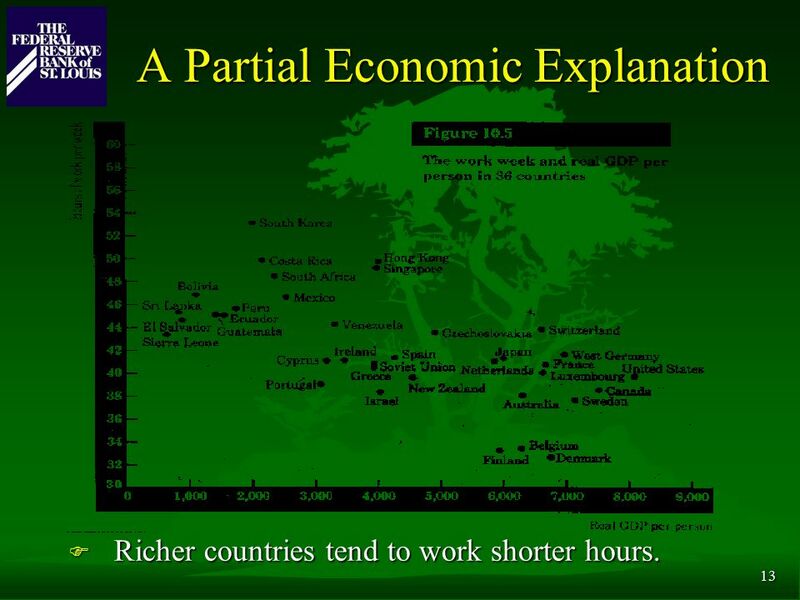 13 13 A Partial Economic Explanation F Richer countries tend to work shorter hours. 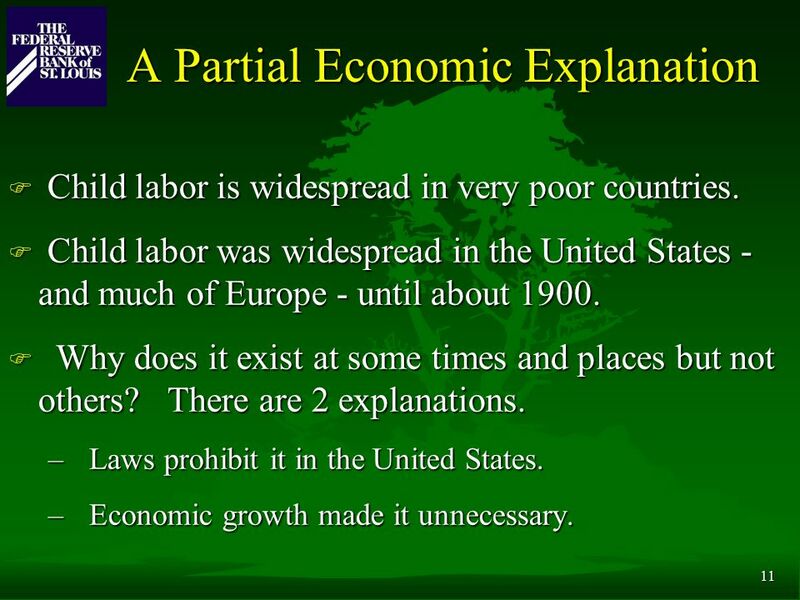 14 14 A Partial Economic Explanation F Child labor disappears as countries get richer. 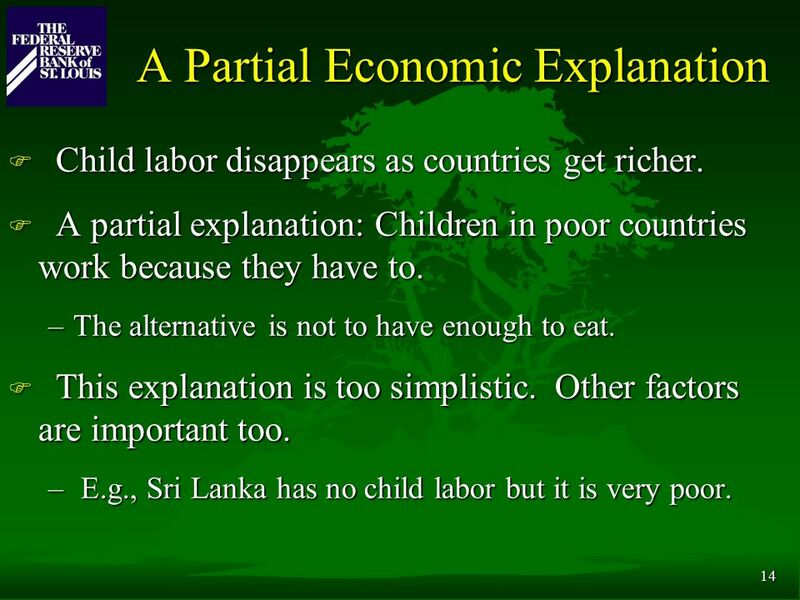 F A partial explanation: Children in poor countries work because they have to. –The alternative is not to have enough to eat. 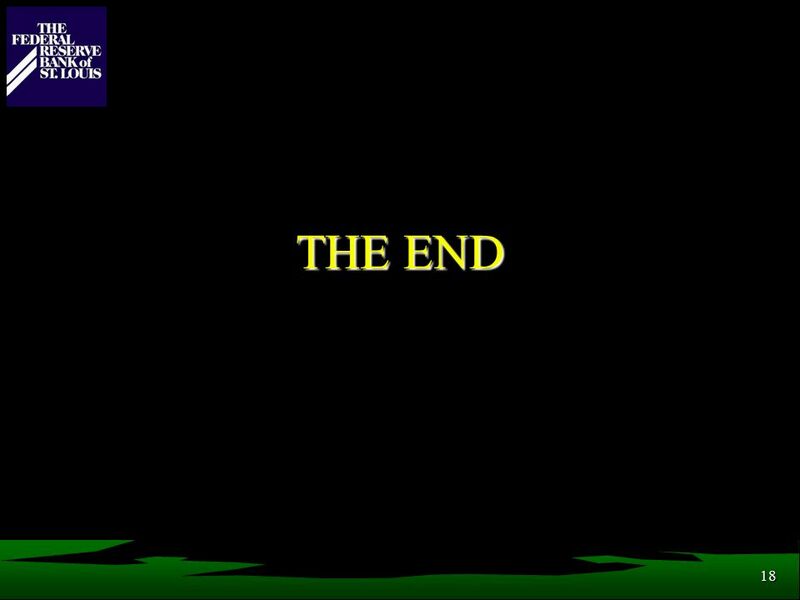 F This explanation is too simplistic. Other factors are important too. – E.g., Sri Lanka has no child labor but it is very poor. 15 15 The Solution? F Boycotts or labor standards will put children out of work or at least lower their wages. – What will they do: Go to school or starve? F Pressure on Manufacturers – What is the recourse? 16 16 The Solution? 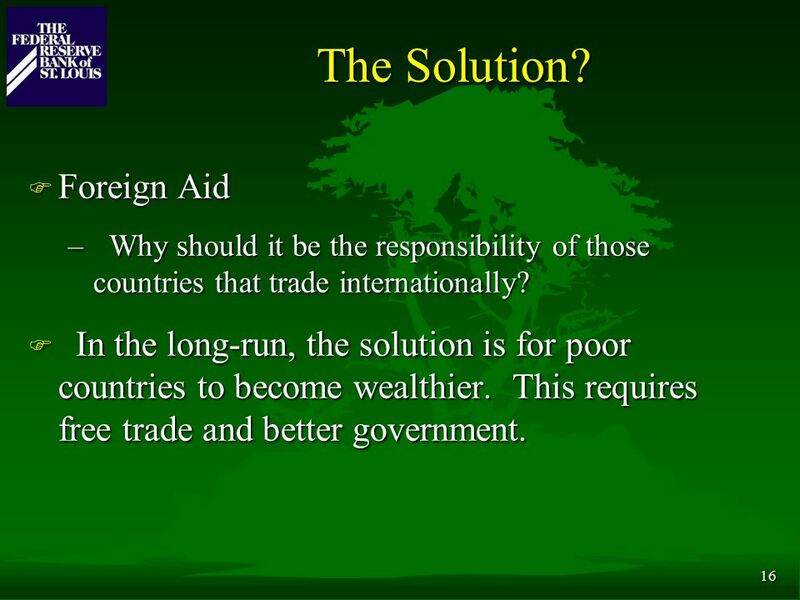 F Foreign Aid – Why should it be the responsibility of those countries that trade internationally? F In the long-run, the solution is for poor countries to become wealthier. This requires free trade and better government. 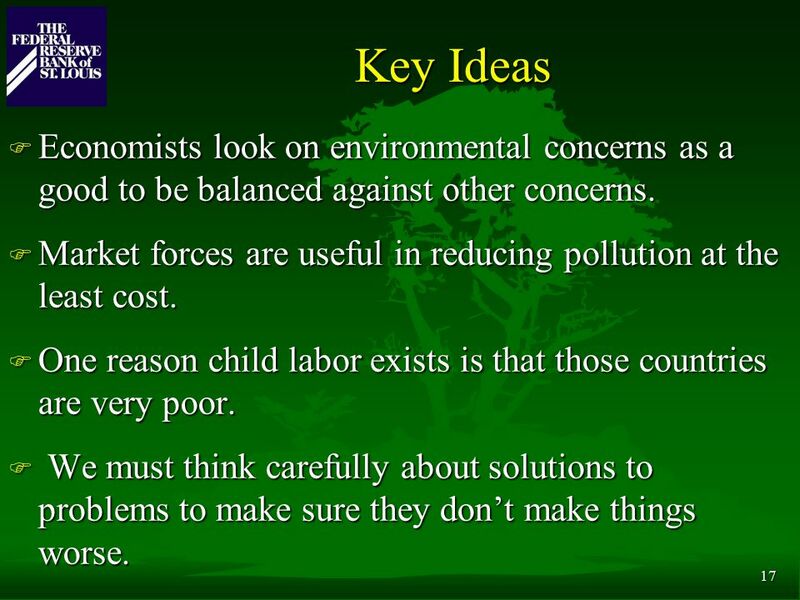 17 17 Key Ideas F Economists look on environmental concerns as a good to be balanced against other concerns. F Market forces are useful in reducing pollution at the least cost. 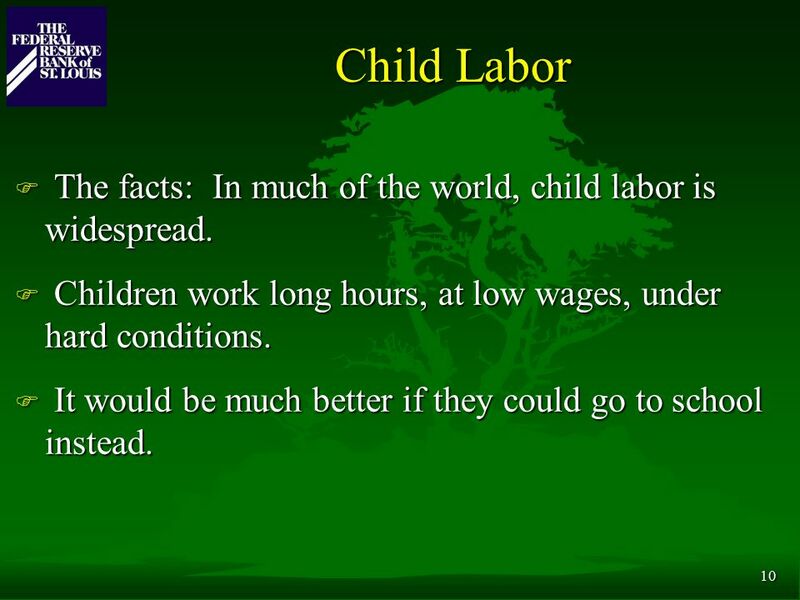 F One reason child labor exists is that those countries are very poor. F We must think carefully about solutions to problems to make sure they don’t make things worse. 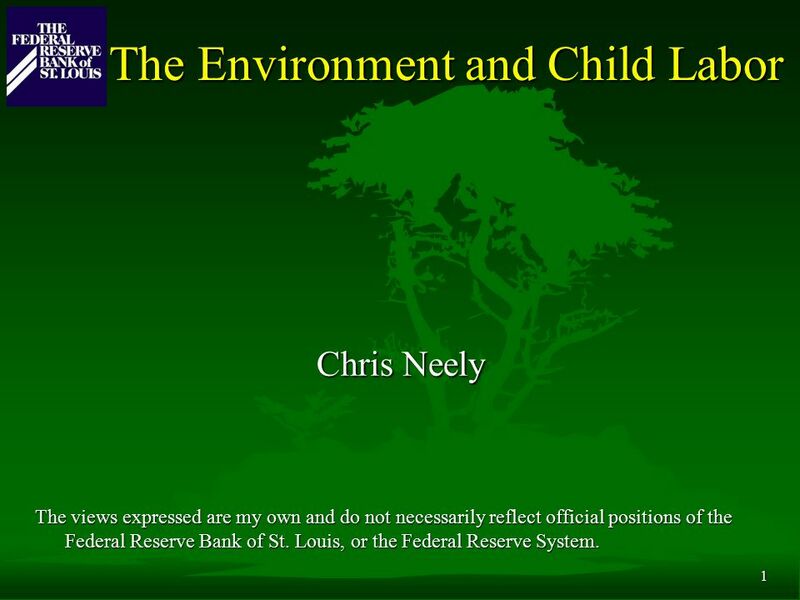 Download ppt "1 The Environment and Child Labor Chris Neely The views expressed are my own and do not necessarily reflect official positions of the Federal Reserve Bank." Economic Systems Ohio Wesleyan University Goran Skosples 5. How a Market System Works. All Rights ReservedMicroeconomics © Oxford University Press Malaysia, – 1.